Until the recent unauthorized release of thousands of classified State Department cables, public attention was rarely drawn to the frequently outstanding political analysis done by American diplomats abroad. Unfortunately, due to sales rights restrictions, we cannot offer The Craft Of Political Analysis For Diplomats for sale in your country. Until the recent unauthorized release of thousands of classified State Department cables, public attention was rarely drawn to the frequently outstanding political analysis done by American diplomats abroad. The existing literature on diplomacy has heretofore been limited to memoirs of former diplomats and analyses of international affairs by diplomats, academics, and think tanks. The Craft of Political Analysis offers a fresh approach, one that provides a context for interpreting this embassy reporting and a guide to understanding the work that went on behind the scenes to produce it. 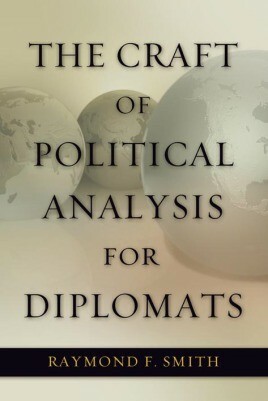 Author Raymond F. Smith combines a practitioner's personal view of what is required to do good diplomatic political analysis with his understanding of the social conflict and change that informed his work for the State Department. Smith clearly explains everything the Foreign Service candidate or professional, as well as the interested layman, needs to know about crafting political analysis, including how to write for the analyst's intended audience, how to make best use of the intellectual and analytical tools of the trade, what happens when the analyst's views differ from government policy, and why political analysis risks becoming irrelevant, even though it is still urgently needed. In addition, The Craft of Political Analysis for Diplomats features two case studies using legally declassified cables not included in the Wikileaks release. The first is built around four highly restricted Embassy Moscow cables on the collapse of the Soviet Union; the second includes two cables on the Arab-Israeli conflict that received the State Department's highest award for political analysis. Selected for the Diplomats and Diplomacy Series of the Association for Diplomatic Studies and Training (ADST) and DACOR, an organization of foreign affairs professionals.